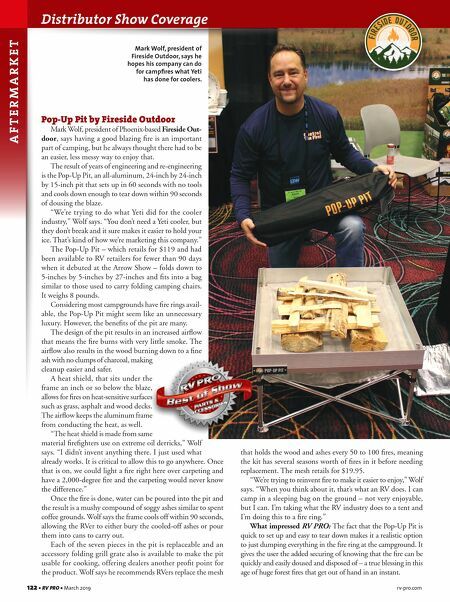 122 • RV PRO • March 2019 rv-pro.com Distributor Show Coverage A F T E R M A R K E T Pop-Up Pit by Fireside Outdoor Mark Wolf, president of Phoenix-based Fireside Out- door, says having a good blazing fire is an important part of camping, but he always thought there had to be an easier, less messy way to enjoy that. The result of years of engineering and re-engineering is the Pop-Up Pit, an all-aluminum, 24-inch by 24-inch by 15-inch pit that sets up in 60 seconds with no tools and cools down enough to tear down within 90 seconds of dousing the blaze. "We're trying to do what Yeti did for the cooler industry," Wolf says. "You don't need a Yeti cooler, but they don't break and it sure makes it easier to hold your ice. That's kind of how we're marketing this company." The Pop-Up Pit – which retails for $119 and had been available to RV retailers for fewer than 90 days when it debuted at the Arrow Show – folds down to 5-inches by 5-inches by 27-inches and fits into a bag similar to those used to carry folding camping chairs. It weighs 8 pounds. Considering most campgrounds have fire rings avail- able, the Pop-Up Pit might seem like an unnecessary luxury. However, the benefits of the pit are many. The design of the pit results in an increased airflow that means the fire burns with very little smoke. The airflow also results in the wood burning down to a fine ash with no clumps of charcoal, making cleanup easier and safer. A heat shield, that sits under the frame an inch or so below the blaze, allows for fires on heat-sensitive surfaces such as grass, asphalt and wood decks. The airflow keeps the aluminum frame from conducting the heat, as well. "The heat shield is made from same material firefighters use on extreme oil derricks," Wolf says. "I didn't invent anything there. I just used what already works. It is critical to allow this to go anywhere. Once that is on, we could light a fire right here over carpeting and have a 2,000-degree fire and the carpeting would never know the difference." Once the fire is done, water can be poured into the pit and the result is a mushy compound of soggy ashes similar to spent coffee grounds. Wolf says the frame cools off within 90 seconds, allowing the RVer to either bury the cooled-off ashes or pour them into cans to carry out. Each of the seven pieces in the pit is replaceable and an accessory folding grill grate also is available to make the pit usable for cooking, offering dealers another profit point for the product. Wolf says he recommends RVers replace the mesh that holds the wood and ashes every 50 to 100 fires, meaning the kit has several seasons worth of fires in it before needing replacement. The mesh retails for $19.95. "We're trying to reinvent fire to make it easier to enjoy," Wolf says. "When you think about it, that's what an RV does. I can camp in a sleeping bag on the ground – not very enjoyable, but I can. I'm taking what the RV industry does to a tent and I'm doing this to a fire ring." 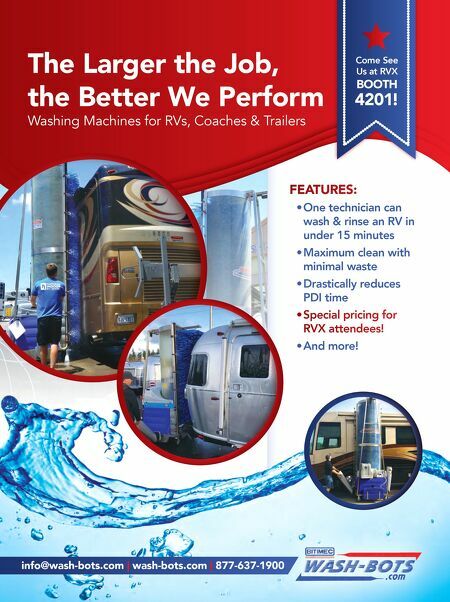 What impressed RV PRO: The fact that the Pop-Up Pit is quick to set up and easy to tear down makes it a realistic option to just dumping everything in the fire ring at the campground. It gives the user the added securing of knowing that the fire can be quickly and easily doused and disposed of – a true blessing in this age of huge forest fires that get out of hand in an instant. Mark Wolf, president of Fireside Outdoor, says he hopes his company can do for campfires what Yeti has done for coolers.